Formed in 2008, the Social Justice Coalition (SJC) is a coalition of civil society organisations in the informal settlement of Khayelitsha in Cape Town, South Africa. 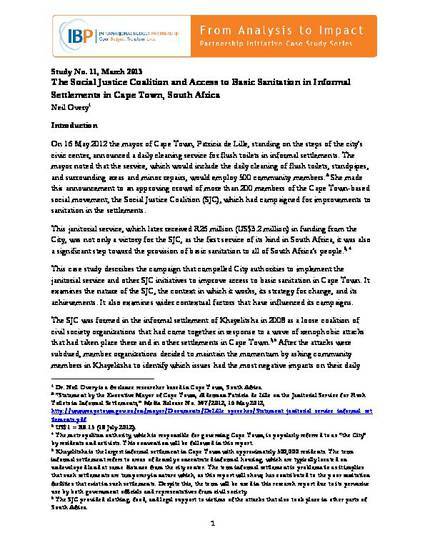 In response to reports from residents about the inadequate and unsafe conditions of sanitation facilities in the settlement, the SJC therefore launched the Clean and Safe Sanitation Campaign in 2010. The campaign aimed to ensure that the City Council properly maintained existing toilets and also provided additional clean and safe sanitation facilities in informal settlements. SJC’s campaign had several concrete achievements, such as the City’s introduction of a janitorial service for regular maintenance of flush toilets and standpipes. To achieve these gains, SJS relied on a multifaceted approach including extensive research, a legal strategy, media publicity targeting both poor and wealthy communities, protest, and some budget work. The one-page summary, short summary, and the full version of this case study are available in English. Short summaries of this case study are also available in Spanish and French.